After a relaxing day of picnicking, our almost three year old decided she wanted cupcakes. Let me preface this by stating that I am not a baker. I dabble, but we don’t do a lot of sweets in our house in general, so I racked my brain to come up with something comprised of ingredients we already had at home. This is one of my favorite ways to cook anything! I call them my improvised kitchen compositions and they are my babies. Enjoy! In a mixing bowl combine the flour, ground ginger, baking powder and baking soda. In another bowl mix the brown sugar, maple syrup, eggs, vanilla extract, half & half, lemon zest and lemon juice. Mash the banana and put it in with the other wet ingredients, then slowly blend your wet and dry ingredients together. Preheat the oven to 350 degrees. Carefully pour your cupcake batter into a non stick cupcake pan making sure to only fill each each about three quarters of the way. Bake for about 18-20 minutes. Try the toothpick trick, stick a toothpick through the center of a cupcake, if it comes out clean, they are done! 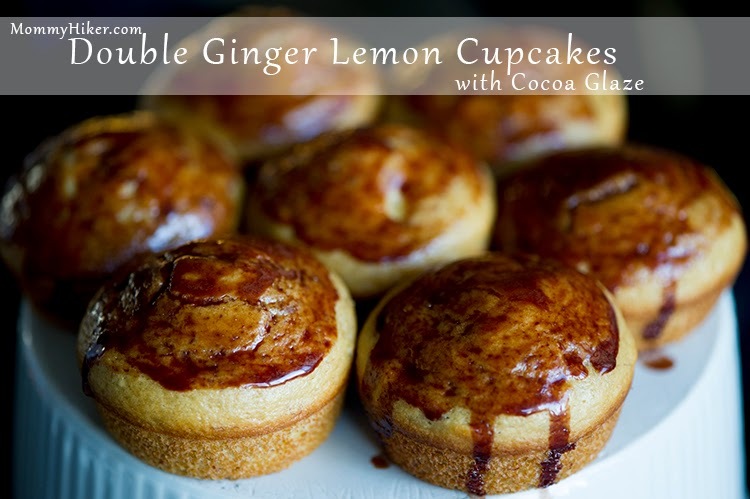 To make the Cocoa Glaze, simply wisk the cocoa powder, lemon juice and honey completely , then drizzle on top of the cooled cupcakes. Enjoy!